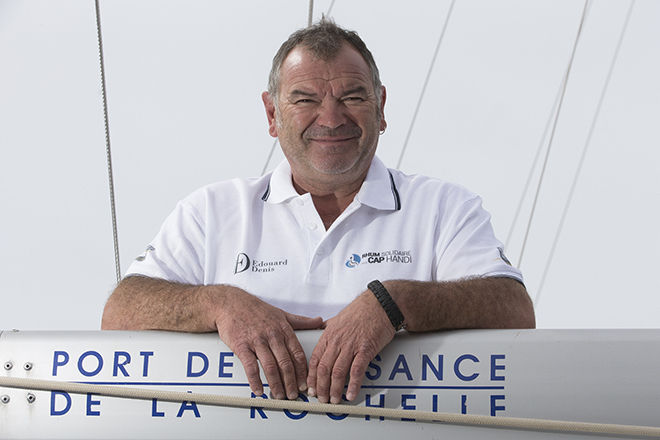 Christophe Souchaud has been sailing for 35 years and is about to take part in the Route Du Rhum for the second time – a single-handed transatlantic race that takes place every four years between St Malo and Pointe à Pitre. This year, his first 40.7 will fly the colours of the CAP HANDI association, under the RHUM SOLIDAIRE CAP HANDI flag.The CAP HANDI association was created in 2015 with a view to giving disabled people a chance to try out ocean sailing for a few days.We met Christophe on his boat in the Grand Pavois basin in La Rochelle. HOW DID CAP HANDI BEGIN? I founded the association in 2015 with Yann Salaun, a journalist with France 3 Poitou-Charente. He followed my race in the last Route du Rhum. Naturally, as the guy who competed in a transatlantic race solo on the smallest boat entered and finished 13th, and who embarked disabled people for the return trip, I grabbed his attention! What is the purpose of CAP HANDI? The idea is simple – “to forget disability and wheelchairs” for the duration of the time spent on the boat. Our philosophy is that everyone should be able to enjoy offshore sailing. We can embark up to 12 people for day trips on the specially fitted out First and 6 people for ocean sailing. How many people have sailed with you in the last three years? Nearly 400. It’s incredible. Last year, hundreds of disabled people sailed with CAP HANDI across the world’s seas over a period of nearly eight months. We have sailed from Ireland to the Senegal coast, taking in the West Indies on the way, on our First. To date, this represents in all 60,000 nautical miles. Our First 40.7 has probably covered more miles than any other of its kind across the world! I bought the sailing yacht in 2008 from the BENETEAU dealer in La Rochelle. It was the last of the series and I was set on buying this particular one! 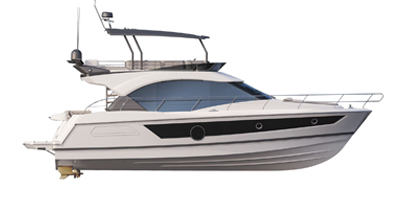 The boat will be handed over to the association entirely at the end of the year. The two other First skippers are my son Jules and Benoit Lambert. How do you explain the success of this concept? Every time we took the boat out to sea, our experiences contributed to new developments to meet the requirements of disabled people on board. We fitted the First with a tiller instead of a steering wheel, we redesigned the interior and, in the end, it means everyone safely enjoys the same comfort. As regards the partnership, the association now has the support of Moreau-Lathus and Groupe Edouard Denis. What do you find so motivating? You could enjoy a rest after all these years? I do what I feel like doing. I enjoy the intense emotions it procures and it gives my life meaning. However, you have to be careful, otherwise it can absorb all your energy. Every time we make a stopover, we contact the local disabled associations. We hope that our concept will find followers in other countries. We would like to see the creation of associations throughout Europe and across the world. We need to extend our work to include disabilities other than physical or sensorial ones, such as autism. Is this Route du Rhum a new challenge? Yes, it represents a year of preparation, with three other people: a mast and rigging expert, a laminator, and a boat captain. This year’s entry will be on a bigger scale, because I will be sailing under the title “RHUM SOLIDAIRE pour CAP HANDI*”. It is a perfect opportunity to promote the association through this great ocean race, much loved by the people of France. To support his project, go to the Rhum Solidaire pour CAP HANDI website.